1. Cook the linguine in boiling, salted water according to pack instructions. Meanwhile, chop the chives (set some aside to decorate), and add to a large bowl with the lemon zest and juice, butter, grated pecorino romano and a good grinding of black pepper. 2. Drain the pasta, reserving a cupful of the cooking water. Toss with the chive butter mixture and 2-3 tbsp of the cooking water, until the butter melts and the sauce starts to coat the pasta. 3. Taste and season, if needed. 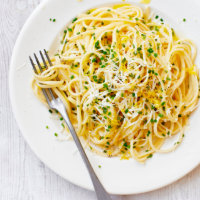 Divide the pasta between bowls, scatter with the reserved chives and the extra grated pecorino romano.